Layouts Page: mostly HO, mostly harmless. A motley collection of old, current and new projects (eventually). Some of the layouts featured here are, or will be, available for exhibition. Exhibition managers please feel free to contact us using the email addresses at the bottom of the relevant page; we'll be happy to get back to you. As with all the pages on this 'site, you can click on the pictures to move on. The content of this section was last updated on 16 April 2008. You can check the 'News' page here to see what changes have been made since you last visited. 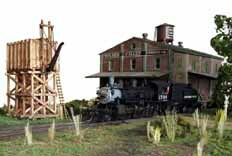 Dave built Colton Junction ten years or so ago as a scene in California. It has become a bit of a standard for the whole group with various layouts in different outlines, gauges and scales spinning off from this, the original design. 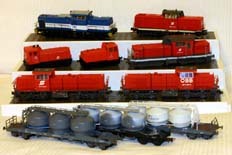 Thankfully the layout lives on with Chris, it's new owner, who's moved the location to Canada. 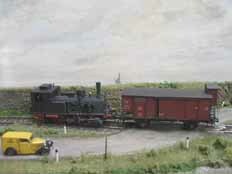 A modern Austrian oultine layout featuring a cement works. I've started putting together some of the structures and detailing the stock (some of which is shown in the photograph above). It's being developed using some of the standards towards the finer end of the HO spectrum which I'm hoping will give more consistent running and improved appearance. And it explains the odd couple of Austrian loco detailing pages starting to feature on this 'site! A real layout of a real place! An operating diorama of a small East German (DR) shed and workshop in HO. Loads of waffle, the theory and practise of modelling from a prototype. And some very ropey philosophy. After some consideration we decided that the baseboards were too heavy for this particular layout so we've stopped working on it for the moment. Be sure the layout is still firmly in my mind but it'll need some new baseboards made specifically for it. 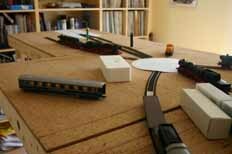 This is a project I shall return to after I've finished playing with Alte Strasse, the new layout featured above. This page last updated 16/04/2008. Copyright © Euram Solutions and Steph Dale 2006-2008. All Rights Reserved.